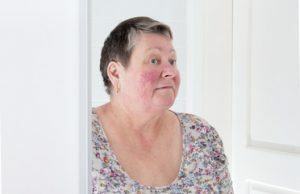 Rosacea is a long-term inflammatory skin condition. The affected areas are mainly cheeks, nose, chin and forehead. It manifests with a diffuse reddening of the affected area (erythema), small elevations of the skin without pus (papules), small dilated vessels (telangiectasias) and recurrent hot flashes. Any one of the previous warning signs is a signal to see a dermatologist or other knowledgeable physician. A quick diagnosis and appropriate treatment will avoid the symptoms become increasingly severe. The cause of rosacea is unknown. A family history of the condition could be a risk factor. While rosacea cannot be cured it can be controlled. Hypertrophy of the sebaceous glands and fibrosis can also occur, the most common being the rhinophyma (bulbous nose). According to different studies, this disease occurs more often in women than in men and especially individuals with fair skin who tend to flush easily. It has been classified by the Expert Committee of the National Society of Rosacea in 4 subtypes but in this post we will focus in one of the most unknown types. Ocular rosacea is often underdiagnosed and remains untreated. In many patients, the eyes may be irritated and appear bloodshot or watery. Symptoms include: foreign body sensation, dryness, burning, itching, redness, photophobia, tearing and blurred vision. Keratitis rarely occurs. The eyelids also may become swollen. Styes are common and scales may accumulate around the eyelids or eyelashes. Severe cases can result in corneal damage and loss of visual acuity. 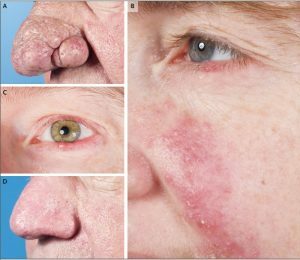 Because the signs of rosacea vary from one patient to another, treatment must be tailored by a physician for each individual case. If you want more information you can contact our physician by calling 968 210 141.